Check out the review of the Minolta AF 28-85mm F/3.5-4.5 lens. 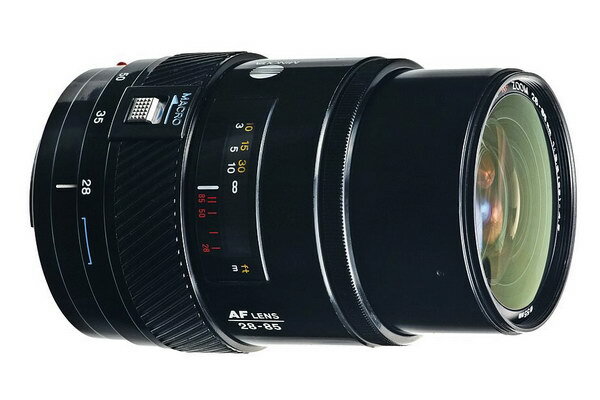 This was one of Minolta's first AF standard zoom lenses issued back in the mid 80s. It probably was a pretty good lens back in the day. Fortunately, that day has passed, and we have better lenses to choose from. It's not a bad lens, it's just out-dated. These quite often sell for less than $100 on eBay. I thought I'd try one when the A900 first came out, as Sony hasn't been very quick in developing full frame, standard zoom lenses, and only has the re-badged 24-105mm F/3.5-4.5 to show. Even so, I'd much rather have that lens than the Minolta 28-85mm, even for three times the price, that's just me. Ya know, they all can't be winners, but, if you're on a really tight budget after the A900 purchase, then check it out and see if it meets your needs. I've been busy, though you wouldn't know it by the lack of updates. I'm finishing the next lens review, which will be the Minolta AF 28-85mm F/3.5-4.5. Here's a tip; it's a real yawner! That's all I'm going to say for now. It should be complete and posted by mid-week. There is a bright point of light in the future; the Sony 135mm F/2.8 [4.5] STF, which I'm also finishing up on. This lens really lives up to it's reputation, and promise. Look for that review by the first week of April. If you're thinking of getting a used lens off of eBay, now is the time. Prices are dirt cheap on Sony kit-type lenses, such as the DT 55-200mm, and 75-300mm, both occasionally can be purchased using "buy it now" for less than $100. I saw a "like new in the box" Sony 300mm F/2.8 G sell for $3800. They usually go for over $5000. The Sony 70-300mm G can be bought for less than $600 if you play your cards right. This usually means winning an auction that ends in the middle of the night, or early Saturday or Sunday morning, that's how you get bargains. If you're wondering what happened to updates from other months, I removed them from the home page and put them in the Home page archives. 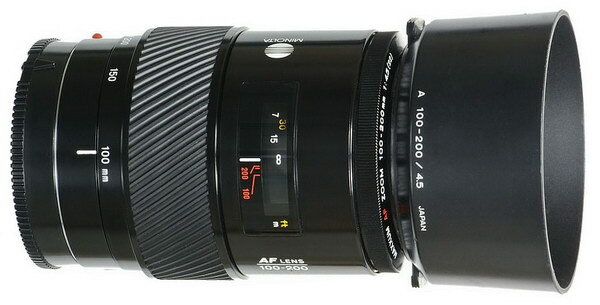 If everything goes well, I should be able to get the Sony 35mm F/1.4 G reviewed by mid-April. I'm still trying to figure out how to get my hands on the two new Sony lenses in the most cost effective way possible. Donations really come in handy for the expensive lens reviews, where I usually rent the lens. My plan is to have both reviewed by the end of April, or the first part of May, let's hope so. I want to know how they perform just as much as other people! Up next for your reading pleasure is the Minolta AF 100-200mm F/4.5 lens review. This little lens is a diamond in the rough, as I think it's just as good as the Minolta AF 70-210mm F/4, only smaller, lighter and less expensive, often bringing less than $75 on eBay. I know it's also 1/3 stop slower, but big deal. There're many other attributes that out-weight the tiny loss of light. As usual, for people wanting instant gratification, go to the bottom of the review page for the conclusion. Well, I've been meaning to update the site for the last several days with the next lens reviews etc, but I thought I'd wait for any new and exciting information about Sony camera products from this years PMA. Unfortunately, my wait was mostly in vain. There is a new 20x 28-560mm super zoom Cyber-Shot camera, listed below. 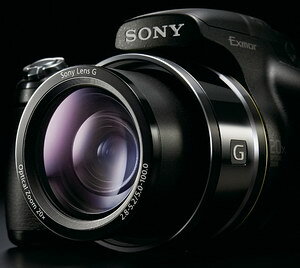 It's loaded with gimmicks like the "G" lens. I remember Canon tried this a few years ago with the Pro 1 carrying an "L" lens, which as it turned out, wasn't the best lens in the class, I think it was the Olympus 8080. Hopefully, Sony engineered this lens with care, and it isn't from a lens supplier that sells the same one to other companies. Other tricks include a panorama sweep mode, where you wave the camera around (like a kid with a toy airplane) while it takes pictures, then stitches them together. It also boasts 10fps, and a high-def movie mode with 1440x1080/30fps, in stereo. If you don't have a super zoom camera, and are looking to buy one, I'd check this one out. If you already have one, or a DSLR, I wouldn't bother with this, especially for $500. Remember the new lenses Sony showed us a year ago at the PMA show; well, they're still showing them, and you're still going to be waiting awhile to get your hands on one--if ever, read next paragraph. A year ago (at PMA 2008) they produced mock-ups of several different lenses that were coming out in the future. Now they've progressed to almost real looking models, but the language the Sony reps are using doesn't instill confidence that those lenses will actually materialize in the near future. They're claiming a super telephoto lens, but no specifics yet; a couple of "DT" lenses, 18-55mm (kit type) it appears, and another 55-200mm? How many do they need? Two "DT" primes, a 30mm F/3.8 macro and 50mm F/1.8. Also, they're listing a 28-75mm F/2.8, which is hauntingly similar to the Tamron and Konica Minolta models. All the new lenses sport an AF/MF button on the barrel. There must be a reason for that, maybe a focus implementation change. Apparently, Sony wants to make clear these lenses are meant to express the possibilities of the Alpha system, and may not be an indicator of actual upcoming products. This is corporate "safe talk" and leads me to believe Sony is operating on the "wait and see" method of launching new products for the Alpha system. The "wait and see" is; "wait" 'till the economy stabilizes, and/or turns positive, then release the products, or "see" the economy swirl around the bottom of the commode, and down the sewer pipe, then forget about launching the products altogether. Let's "wait and see," shall we? I actually hope some of those lenses never see the light of day, as they are already represented in the current lens lineup, or are not significantly different enough to generate interest and make people want to cough up the money to buy them, at least in my opinion. Bottom line; there're plenty of very useful AF Minolta lenses out in eBay land, and I'd buy one of those before waiting on a Sony "possibility." Sony still seems a little timid and awkward in the DSLR world. Their Carl Zeiss, and "G" lenses are great, but they still have a rather amateurish DSLR website, full of technical errors and overly simplistic descriptions of products. If Sony wants to attract serious users, it should have a serious and professional DSLR website. The current website is clearly aimed at the average snap-shot consumer. On a final note; get yourself psyched up for the AF Minolta 100-200mm F/4.5 review, coming up next! 28-560mm F/2.8-5.2 "G" lens, WOW!! Old Zeiss lenses are now junk! Shoots 10fps at full resolution. Six bladed mechanical aperture "produces beautifully defocused backgrounds" claims Sony. Anti-blur mode takes six pics and blends them for a (hopefully) good shot, and is also supposed to help with noise reduction. New panorama feature allows you to "sweep" the scene, and the in-camera processing will stitch them together. Video recording at 1440x1080, (in stereo) 30fps, plus lesser quality.